Villa Hügel in Essen is a genuine work of architectural mastery, which in the course of its history has paid witness to great, important matters and people. The villa is the former residence of the Krupp family in Essen. The beautiful property is spread over 28 acres of land located in a prominent position above the valley of the Ruhr and Baldenaysee. The design took more than five years and a decade to build and was finished in 1873 by Alfred Krupp. He was a strange man, a lawyer, an industrial tycoon, dealing mainly with steel production. He was the owner of the Empire Bertolt, which controlled more than 100 factories and industrial plants, making him during the 19th century one of the richest men in Europe. As such he had a lot of offenders. As a result, house builders faced a very difficult task. Villa Hügel is of a solid structure, with no wood used and this made it more of a challenge. To secure safety from fire, Alfred Krupp had an office with a triple iron door. The king of an iron was not only afraid of fire, Krupp ordered that no window would be opened in the Villa. He also prohibits any gas because gas is explosive substance. Mr. Krupp had no particular need for lighting because he could keep his notes both bright and in the absence of any lighting. To ensure oxygen got into the villa, there were built special channels that had the task of supplying the oxygen and also the smell of manure as Krupp had a particular regard to smell and they are separated by the "wholesome" and "harmful". Beneficial to his favorite smell of manure, is why his work office is situated at a height of two floors above the horse barn. Villa Hügel has a total of 269 rooms, all "fortresses" and has a total area of 8100 square meters. Today it plays an important role in the relationship of Germany with the Eastern world. Also at the villa can be seen about 150 exhibits representing paintings, sculptures, showing visitors a wide range of Tibetan culture, art and traditions. 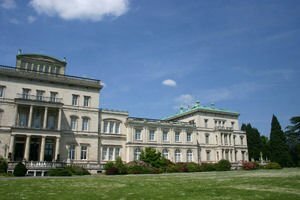 Today Villa Hügel is far from that "dark prison", built by Alfred Krupp, it is now distinguished by outstanding architecture and is considered an excellent example of classic works in Germany. Villa Hügel consists of a main house, guest house, huge and beautiful garden with trees and lakes.